Starting from scratch, Dr. Anthony Maloof needed a design and build team to fit-out his new consulting rooms in Macquarie St. Sydney but he was struggling to find anyone who could understand how his business operated. “I was faced with quite a difficult renovation as it required significant design detail to provide for a variety of medical as well as cosmetic services,” explains Dr. Maloof. After talking to several consultants Dr. Maloof decided to engage Charter Design & Build. The promise of a single integrated solution from the team was a major draw card. Charter Design & Build guided Dr. Maloof through the development application, design process and construction programme. The result was exceptional. 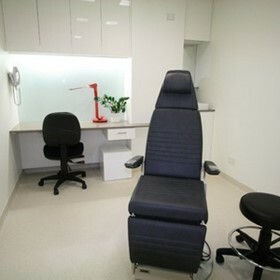 Engaged to fit-out two more consulting rooms in the next two months including a space for Dr. Sergery Federine in Campbelltown, Charter Design & Build are experts in the medical fit out & refurbishment field. Contact them today to discuss your requirements. Successfully completing over 350 design & construction projects in the last ten years, Charter Design & Build services also include the fit out and refurbishment of foyers and office interiors through to whole building refurbishments and new construction. Charter Build will listen to your requirements, analyse your workspace or building and design and build your project for a single fixed price. We make the process simple by eliminating the need for you to manage multi-responsibilities, allowing you to continue normal, commercial, activities unhindered. Formed 10 years ago by the current managing director, Charter Build has built an enviable reputation for creative and exciting design, innovative construction solutions, reliability and trust. Operating in the highly competitive Sydney market and interstate for existing clients, Charter Build has successfully designed and built over 350 commercial building and interior projects, ranging from small office fit outs to multi-storey, building refurbishments. With solid client loyalty, strong management and a sound balance sheet, Charter Build has weathered the global financial crisis well and is poised to increase its market share with the opening of a new office in Melbourne and entry into the healthcare and hospitality/club markets. Although we work with the latest technology and systems to design and build our projects, good old fashioned, person-to-person business, combined with exceptional customer service, is what sets us apart from our competitors.